Labels: "A timeless yet solid feeling that speaks for itself"
2006 Painting of the New England Scene. One of the most famous landscape compositions. 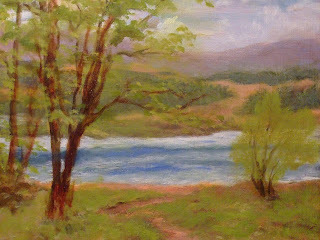 Painted in RC Fine Arts Studio in Berkley, Ca. This was the first in a series of piantings done on the west coast. Labels: "A feel of a place that exists, somewhat removed from the everyday world." 9/3/08 Hunt Hill Farm Gallery juried exhibit.